This week saw Owens-Illinois, the world leader in glass packaging, celebrate its €30m investment in its Alloa, Scotland, facility. During an event attended by O-I Chairman and CEO Al Stroucken, customers, employees and government officials, the company highlighted the plant’s upgraded capabilities to better serve the Scotch whisky industry and other drinks businesses. The investment includes a £3.9m Regional Selective Assistance grant from Scottish Enterprise. The Alloa plant is uniquely positioned in the heart of Scotland’s distilled spirits industry. The investment builds on a heritage of 260 years of glassmaking on this site and on the skills of the company’s 600-strong expert workforce. 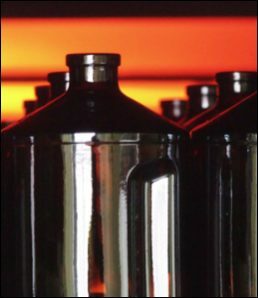 The investment also greatly increases O-I's capability to make black (pictured) and other premium glass colours. O-I is also the first UK glass company to install its own CNC mould milling machine to speed up production of sample moulds. A new CAD suite enables the company to design bottles alongside its customers and their design agencies, and a new Kammann screen printer – the first of its kind at a UK packaging plant – has been installed to enhance O-I's bottle decorating capabilities. The investment in Alloa is part of the company’s asset optimisation programme. Over three years, O-I is investing significantly in Europe to strengthen its capabilities and market leadership position. By the end of 2014, O-I will have invested more than €280m over two years. O-I’s European operations include 8,000 employees in 10 countries, O-I Europe had nearly €2.1bn of sales in 2013, representing approximately 40% of the company’s global sales.